The apartment is on the 2nd and last floor of a semi-detached house, located in a hilly area of ​​Castelfidardo 7 Km. From the beaches of Numana and Monte Conero. Just a few minutes drive to get to the beaches along the road that is easy and fast . The apartment is spacious, bright and very comfortable. The entrance is independent, accessible by an external staircase, it overlooks a large terrace (60 sqm2) for the exclusive use of the apartment where you can admire the town below and Monte Conero. On sunny days you can eat outside or sunbathe, in this regard guests will have a table terrace, garden chairs, deck chairs and a barbecue. The day department consists of a large and bright living room with a sofa, armchair, dining room, equipped kitchen. The bedrooms are accessed through the sleeping area where there are two bathrooms with a window, both are equipped with sink, bidet, toilet, shower. The air conditioning system is located in the sleeping area with hot and cold air, while the whole house has a methane heating system with independent system. The apartment is equipped with TV, electric oven, fridge, freezer, iron and ironing board, washing machine, hairdryer, etc. Pets allowed but only if well behaved and clean, BUT WE RESERVE to authorize their case presence in case and in relation to the requested period. The house is in a great location, as the center of the village, the park of the Remembrances, restaurant, bars, pharmacies, supermarkets, bus stops are within walking distance in a few minutes. Free parking in front of the house. The Conero Park, the sea and the equipped and not beaches, are just a few minutes by car and the road to get there is quick and easy. For those who reach the sea by car find parking is not a problem. At the entrance of Marcelli di Numana and Numana you will find a large parking where you can park your car all day for €. 2 and choose to go down to the sea on foot (it takes 3 minutes) or reach the shores through the many buses that the City of Numana offers tourists for free for the period from June to mid-September. Easy to reach and a few kilometers away: Loreto, a religious destination, Recanati, birthplace of the poet G. Leopardi and numerous other medieval villages, many of which have earned the recognition of the most beautiful villages in Italy. Castelfidardo is famous for its accordion that is produced here by hand. Every year in September in Castelfidardo there is the accordion festival; world-renowned event that attracts numerous musicians and fans of musical instruments from around the world. My name is Ivana, I am a housewife, I love cooking, I love animals and nature. I put my house available for you to enjoy a pleasant, quiet in a village of the Riviera del Conero where nature is wonderful with the sea a few miles and fields of sunflowers that make it seem like the town of Castelfidardo a wonderful postcard but not certainly betrays those who love the sea and nature with Mediterranean vegetation that blends perfectly with the white cliffs overlooking the sea. This house is the right solution for those who want to pair their holiday at the beach with the discovery of the whole territory, with its history, traditions and culture. Since ever, my family and I, when we could, we went on holiday renting holiday homes, because I think it's important to have a holiday free of times and restrictions, which already influences our daily life. Thanks to my direct experience, I chose to let my house to all those who needs a solution for their holidays or their work travels or why not? Just to take their mind off and relax for some days! In few minutes by car it's possible to reach the Riviera del Conero's beaches. The road is fast and simple. After a splash in the clear water of the sea and a pleasant sun bath, coming back home, you'll be able to enjoy a wonderful panorama given by the harmonious rise and fall of near hills and valleys. Rural sceneries which blend in seasonal colors, hills surrounded by green olive trees, vineyards and sunflowers. In this peaceful environment, you may decide to give yourself an afternoon to visit the wineries where, beyond discovering local traditions, you may taste Rosso Conero (Camerano) and Verdicchio (Ostra Vetere) or visiting the near medieval towns and dining in some typical Restaurants or in some food festival which are often held from May to September. For Theatre and Opera Enthusiasts, the Sferisterio Opera Festival is organized every August in Macerata, while if you're too tired to drive at night, plenty of events are organized in Castelfidardo from July to September , few steps away from home. I suggest you our house because it's a REAL home, different from what it's usually offered to tourists nowadays. The house is located in a residential area made of detached and semi-detached houses with box and gardens, where parking is easy and free. The interiors are spacious and furnished and decorated with love and a touch of personality. There's Air conditioner for the most demanding. Outside, the wide open terrace which looks on the underlying town, Conero and the sea, allows the guests to enjoy the sea breeze and the joy to have lunch outside or a romantic dinner in the candlelight. Possibility to park for free on the street in front of the house. The road is one-way where there is always availability of parking without time limits. The living room and the dining room are a unique space of about 40 square meters. very bright and spacious. In the living room there is a two-seater sofa bed and a comfortable armchair. Present a TV. complete with cabinet display, the table is for four people but can double and accommodate up to six people. Possibility of transfer from the airport. Casa sui colli marchigiani, vicina alle piú belle località del Conero tutte raggiungibili in un quarto d'ora di auto. Comoda, ben curata, pulita e accogliente, perfetta per amici o famiglia. Bello il terrazzo per concedersi una cena sotto le stelle, comodo parcheggio a 50 metri da casa e servizi tutti vicini compresa una rosticceria salva fame all'ultimo momento. Che dire della proporietaria, gentilissima, precisa e un'ottima consigliera per organizzare al meglio la vacanza. Castelfidardo e molti dei borghi vicini meritano sicuramente una passeggiata. Grazie ragazzi, è stato un piacere per me ospitarVi, spero che ci saranno altre occasioni in futuro. La casa per noi è stata perfetta, nuova, due bagni e due camere e con due bambine davvero comoda; ben arredata e con tutte le comodità. A dieci minuti d'auto dal mare, lontana dal caos, su una collina circondata da campi di girasole. Il paesaggio del Conero è davvero bello, così come il mare. Molto ospitale la padrona di casa. Die Lage der Wohnung in Castelfidardo hat Vor- und Nachteile. Sie befindet sich in der Nähe von Geschäften und Lokalen, aber auch an einer belebten Straße mit Steigung. Die Wohnung ist recht groß, gut und mit geschmackvollen Details ausgestattet. Besonders gefiel uns die Ausstattung mit 2 Badezimmern. Die Terrasse haben wir täglich genutzt, sowohl zum Frühstück als auch Nachmittags und abends. Die Vermieter sind sehr freundlich und jederzeit zur Hilfe bereit. es freut mich, dass Sie die Terrasse mit dem wunderschönen Ausblick auf den Monte Conero voll genossen haben. Betreffend Ihren genannten Nachteil zur Lage der Wohnung möchte ich gerne hinzufügen, dass es sich um eine Straße einer Kleinstadt handelt, und nicht um eine Straße wie in einer großen Stadt oder Metropole. Die Straßen sind mit Geschwindigkeitsbegrenzungen versehen und nur zu Spitzenzeiten und hauptsächlich tagsüber belebter Verkehr. Da Sie größtenteils Ihres Aufenthalts auf der traumhaften großen Terrasse verbracht und sich ihr durchaus erfreut haben, gehe ich davon aus, dass die Lage Sie nicht so sehr gestört haben dürfte. Ich bin weiterhin erfreut darüber, dass Ihnen die Wohnung mit ihrer Ausstattung gefallen hat und dass ich sehr freundliche und angenehme Personen wie Sie als Gäste in der Wohnung gehabt habe. 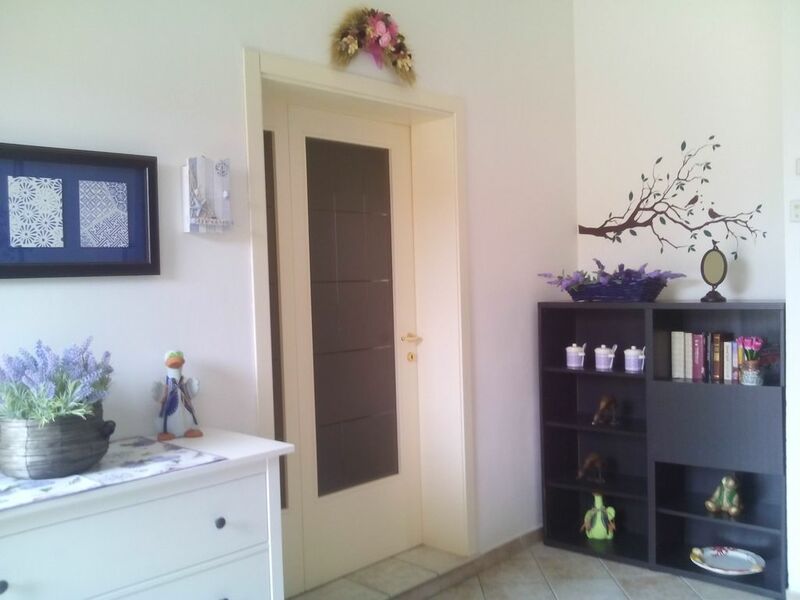 La casa spaziosa, pulita e ben organizzata si trova in una posizione strategica a poca distanza da luoghi incantevoli sia sotto il profilo paesaggistico che artistico. I proprietari si sono subito messi a nostra disposizione e ci hanno fornito utili consigli su ristoranti e luoghi da visitare. Il soggiorno è stato perfetto. Ritorneremo. Wir haben vergangenen September einen wundervollen Urlaub zu zweit in Castelfidardo verbracht. Mit unserem gesamten Aufenthalt bei Ivana waren wir mehr als zufrieden. Bereits bei unserer Ankunft wurden wir das erste Mal positiv überrascht. Die Wohnung ist tatsächlich so schön, wenn nicht schöner als auf den Bildern versprochen. Sie ist geräumig und gut aufgeteilt, geschmackvoll eingerichtet und sehr sauber. Selbst zu viert würde diese Wohnung noch mehr als ausreichend Platz bieten. Auch die Küche ist mit allem Notwendigen ausgestattet. Ein Supermarkt bei dem man alle wichtigen Lebensmittel bekommt, ist direkt eine Straße weiter. Wer nicht kochen möchte und selbst zu außergewöhnlichen Zeiten lecker essen möchte, wird in der Pizzeria Pippo fündig, die man bequem zu Fuß erreicht. Die Wohnung liegt strategisch günstig in Castelfidardo mit einem schönen Blick über die Gegend von der Terrasse aus. Die Riviera del Conero bietet viele Ausflugsmöglichkeiten. So sind z.B. die Due Sorelle immer einen Tagesausflug wert. Auch erreicht man schöne, aber abgelegene Strände und Buchten, oder auch Nachbarstädte für Besichtigungen oder Stadtbummel recht schnell. Es empfiehlt sich allerdings ein Auto um die Gegend zu erkunden. Castelfidardo bietet verschiedenste Veranstaltungen, deren Besuch sich lohnt, wie z.B. einen Markt/Straßenfest (fiera). All diese Tipps holt man sich aber am Besten von den Vermietern selbst. Bei unserer Ankunft wurden wir herzlich empfangen und mit allen wichtigen Informationen und geheimen Tipps versorgt. Ivana war den gesamten Aufenthalt über sehr zuvorkommend. Sie opferte sogar ihren freien Nachmittag und bot uns eine private Erkundungs- und Einkaufstour. Wir können einen spannenden und zugleich erholsamen Aufenthalt bei Ivana nur wärmstens empfehlen und kommen selbst gerne auch einmal wieder zurück nach Castelfidardo. sono molto contenta di averVi conosciuto. Siete stati degli ospiti veramente esemplari! Avete avuto molta cura e rispetto della casa ed è stato un piacere per me aver trascorso un pomeriggio insieme a voi. Cari ragazzi spero tanto di rivederVi, Vi aspetto e Vi abbraccio. Whoever will want to discover the marchigiano territory, in the beam of little kilometers, she will be able to visit the graceful history rich medieval citizens of Osimo, Offagna, Recanati, Camerano, Jesi.The City of the Accordion, like is known universal for its first voted industrial vocation to the instrument to reed, it sets in middle position between mountain and sea. Placed near the historical center, the huge National Monument of the Marche is realized in the first years of the 20th century from the carver Vito Pardo in order to commemorate the Battle of Castelfidardo of the 18 september 1860, that it was decisive in the fights for the Unit of Italy. Every year to Castelfidardo in September (19-23/09/2014) the international Festival of the accordion with cultural events and manifestations is celebrated. To cheer the stay of the visitors they are the numerous points of refreshment, which eating houses, pub, restaurants with the marchigiana typical kitchen. In the month of July the culinary manifestation holds “turenjoying” where meal of the tradition to modest prices are offered and the evenings are cheered with musical shows and manifestations. Le chiavi vi saranno consegnate dal proprietario VERY IMPORTANT: bed linen and towels are not included, the cost is €. 20 for double bed€. 10,00 for single bed, €. 10,00 for towels per person and every time you change, or you can bring your.